The school year is winding down—and I find myself thinking more and more of warm poolside days—yet everywhere I turn, rich mentor texts seem to come my way. I’ll find something and think, “Oh, that would have been perfect to use with ____” or “That would have worked great with ____!” Although it may be too late to use these ideas this year, I click my bookmark button and tuck them away for next year. 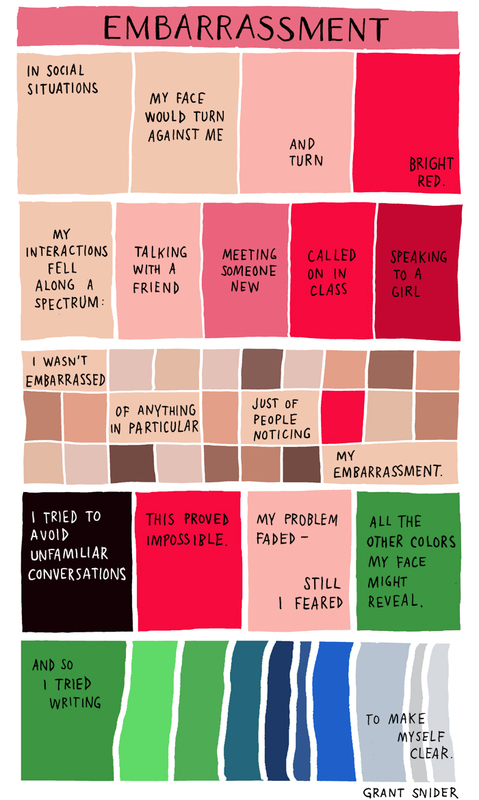 One mentor text I can’t wait to use is Grant Snider’s Incidental Comics. Although I’m usually suspicious of most social media “suggestions,” I have to thank Facebook’s algorithm for introducing me to Snider’s work. 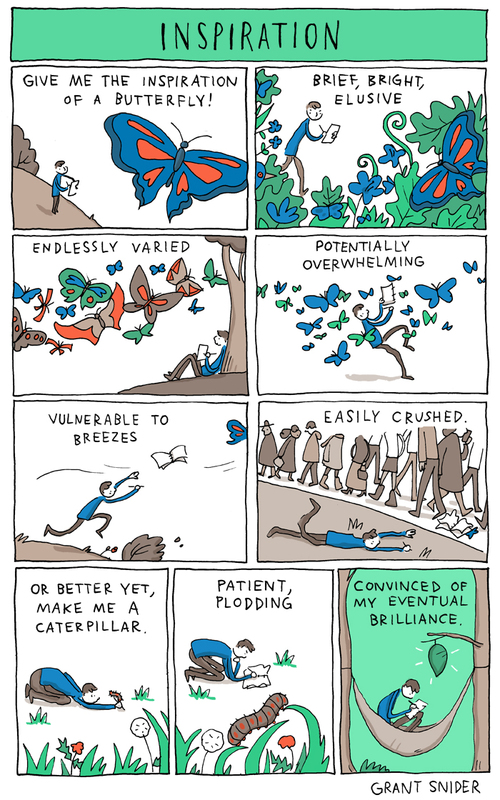 I’m surprised that I hadn’t come across Grant Snider’s work before. 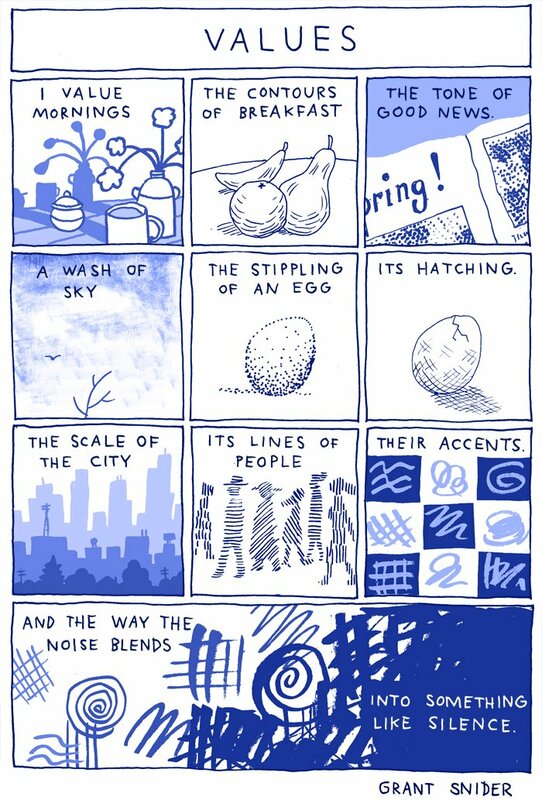 As someone who loves the way words and pictures can work together, whether it’s through infographics or graphic novels, the moment I started browsing Snider’s work, I fell in love. And once my teacher-brain took over, I couldn’t stop imagining the possibilities for reading and writing for next year. Recently, many of Snider’s visuals and graphic essays were published as a book called The Shape of Ideas: An Illustrated Exploration of Creativity. I love the word shape here. Sometimes I worry that while we try to encourage our students to be creative individuals, schools too often restrict students’ writing—and thinking—into predetermined shapes (I’m looking at you, five-paragraph essay). The more we can show students the various ways that ideas can be expressed—all of writing’s shapes and sizes, genres and modes, words and yes, images—the more we can start to give students not just creative freedom, but creative ownership. Students become creatively empowered. 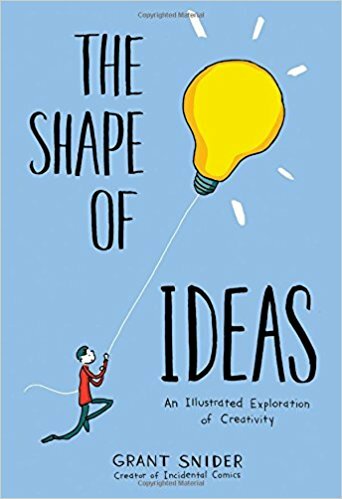 And using mentor texts like Snider’s The Shape of Ideas can be an important first step in that direction. So although I usually post about work I’ve already done with students, I thought I’d take this space to tease out some ideas I have for using Snider’s work in my classroom. After all, going into the summer inspired with fresh ideas for next year lets me start vacation energized rather than worn-down, looking forward not back. What I love about this visual is that it makes concrete what many students may also have a hard time articulating. Students might have either too much or too little say about their reading lives, and so by framing it in stages, by asking students to focus on one stage versus another, this visual may provide some students with just enough direction to get started. At the same time, I’m sure that some students might disagree with the stages of reading as illustrated here, especially its seemingly chronological, one-directional approach. What would they change about how reading is represented? 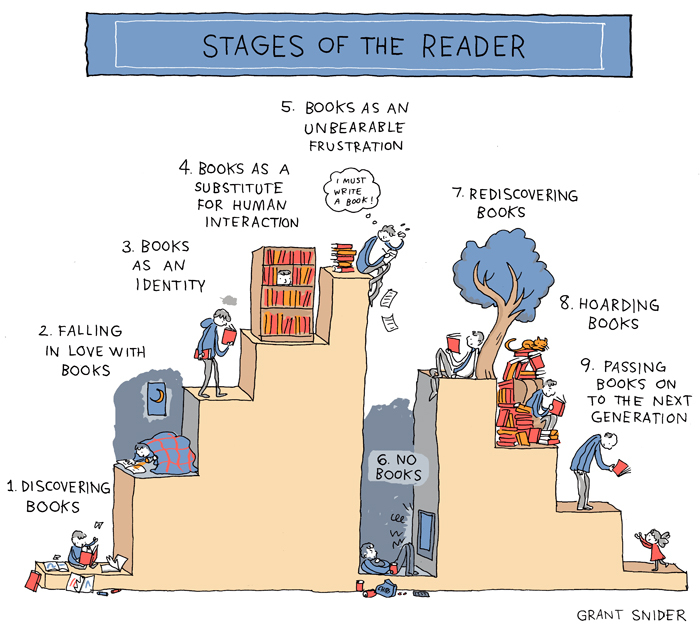 What stage of reading are you currently in? Which stage has been the most important in shaping you as a reader? What experiences did you have at that stage? If you’ve experienced stage 6, why? 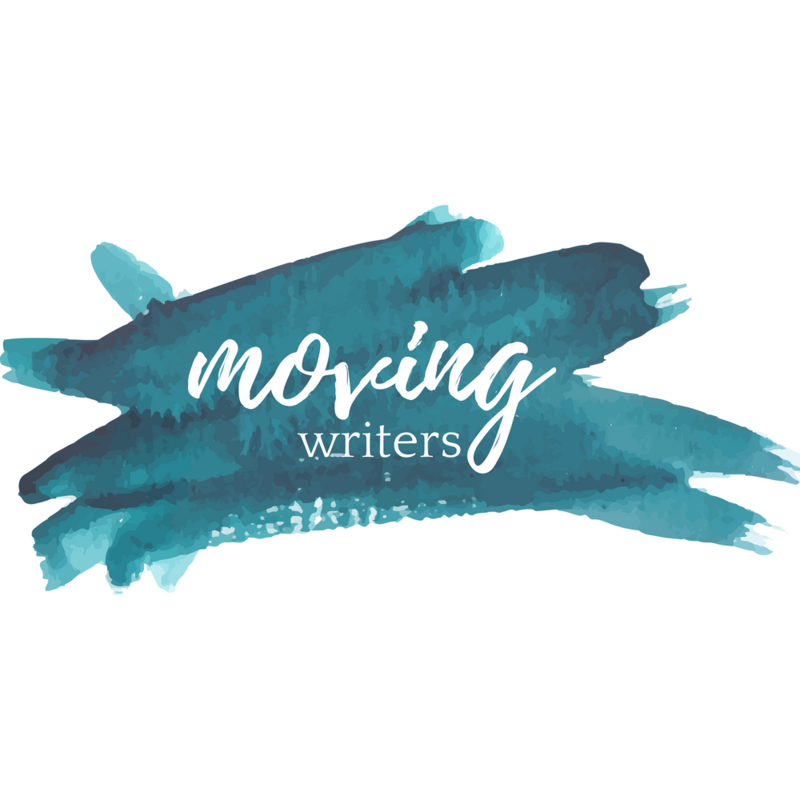 What was going on in your life that turned you away from books? In what ways is this visual accurate or representative of your own reading experiences? If you could redraw this idea into a different shape (instead of steps), what shape would you use? What’s on your reading “bucket” list? What are you goals as a reader? 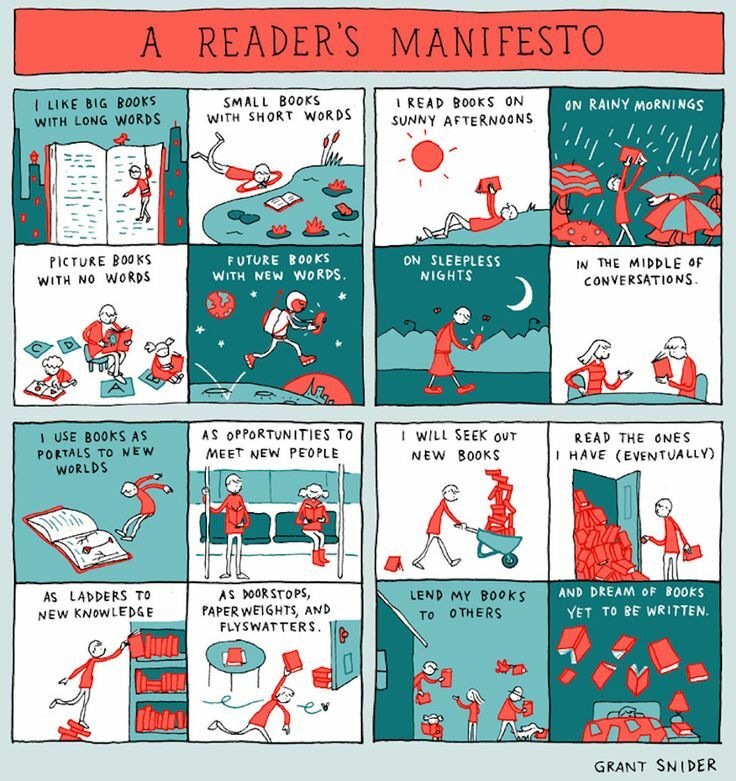 Snider’s “A Reader’s Manifesto” (below) would be another wonderful text to look at. I already have this page bookmarked as one of my first lessons on notebook writing in the fall. I imagine asking students to write (or draw) something similar. Here, Snider compares inspiration to a butterfly, but what would they compare inspiration to? Perhaps for some students, inspiration isn’t a butterfly, but more of an evergreen tree or the Santa Ana winds or an icicle on a window. Often, students share that they have “nothing to write about”—but we all know that that’s not true. It’s that students aren’t practiced in understanding and nurturing their inspirations, especially the small, daily moments we tend to overlook. By asking students to think more deliberately about the writing process, they can better understand where their inspiration comes from and how they can turn what seems like “brief, bright, and elusive” moments into something substantial. Another struggle students encounter early in the year with notebook writing is to keep writing. We’ve all had students who write down a line or two, put their pencil down, and then stare at the wall for the rest of notebook time. Even when I tell students to just “keep writing” until something comes to you, to “let your thoughts flow,” many students remain skeptical. I first read Kelly Gallagher’s Deeper Reading in 2009, but I still remember many of its lessons, but especially Gallagher’s point to use metaphor to help students deepen understanding. When students see how metaphors are used to discover and explore, to explain and inform, to argue and evaluate, their understanding, especially of complex ideas, becomes more nuanced. And because writing is thinking, the deeper the thinking, the better the writing. 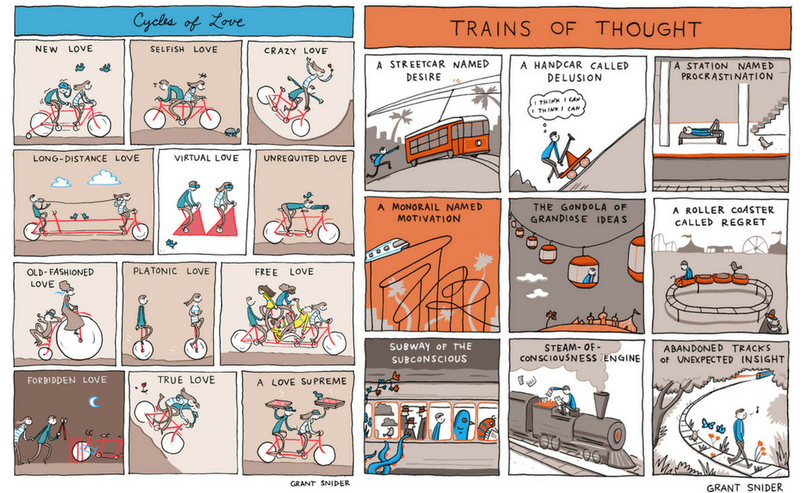 When I saw Snider’s “Cycles of Love” and “Trains of Thought” (above), I knew that they’d be wonderful to use to encourage students to not only think in terms of metaphor, but to also stretch their thinking and play with language. These two graphics, treated either separately or together, could help students think about how they might explain an abstract concept in more concrete, accessible terms for their readers. In the tradition of essays like “On Dumpster Diving” by Lars Eighner, “On Keeping a Notebook” by Joan Didion, and “On Compassion” by Barbara Ascher (and using those as mentor texts), my students write their own “On” essays every year. I can’t wait to use Snider’s “Cycles of Love” and “Trains of Thought” to help push their thinking about the subject of their essays. In fact, “On Dumpster Diving” could be easily reimagined as a graphic essay in the spirit of “Cycles of Love” and “Trains of Thought” (and I know exactly which passages I would use!). In this way, Snider’s work can illuminate different modes of writing, like description and process analysis. What’s powerful about “Cycles of Love” and “Trains of Thought” as mentor texts is that there are so many possibilities for using them to extend thinking and writing. They could be used in the early stages of a drafting process to tease out an idea, in the middle of revision to inspire deeper thinking, or even as an end product itself where students could draw and create their own graphic essay (or turn their traditional, written essay into graphic form). Which panel / metaphor stands out or speaks to you, and why? Choose one panel: in what ways does it reveal a deeper truth about love or thought? How? “Train of thought” is an idiom, and here, Snider plays with that idiom. What other idioms could be visualized in the spirit of Snider’s work? How? I spend a lot of time in the beginning of the year on the personal essay. This serves two purposes. First, it gives me valuable information about my students and who they are, what they love, what they hate, what they need, and what I can do. It helps me to see them as the rich and complex individuals they are before (or instead of) seeing them as students I need to “grade.” Second, personal essay writing allows students to know who they are. It gives them time to reflect on the experiences and moments that have made them into the people they are and will become. Of course, we read many examples of beautiful personal essays, and now I’m so excited to add this next visual component. 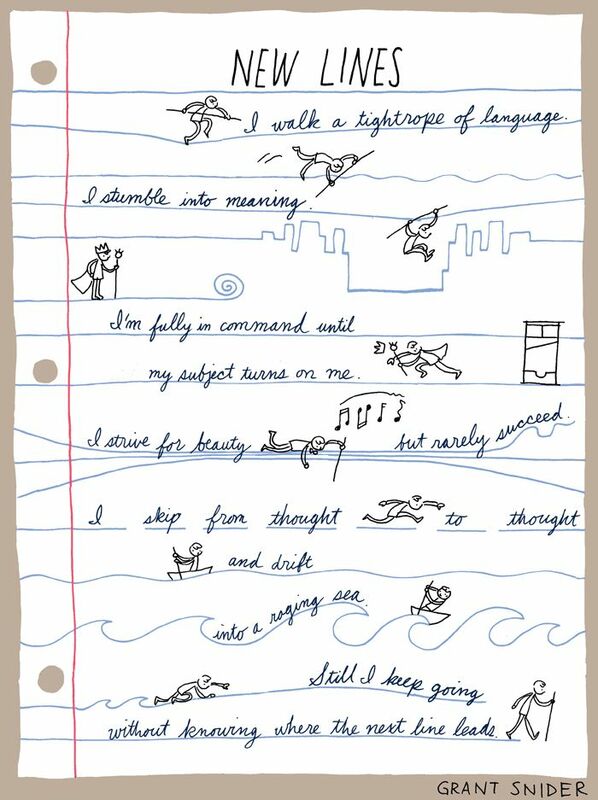 Above, “Choose Your Own Memoir” offers an accessible and inviting way for students to write about themselves. It’s hard to write about yourself; any teacher who has helped students with college essays knows how true this is. The simple and direct structure of “Choose Your Own Memoir” can help students narrow down on key events or moments. In the storyboard below, it’s easy to see how you could write an essay about a particular row—for example, a descriptive piece on your family history, as in row 1—or even dive deeper into a single panel—for example, a narrative on the way books have been a way to escape, as in the end of row 3. And most importantly, as the last panel points out, as we write, what’s the greater truth we can or need to reveal? Likewise, Snider’s “Values” (below) could also inspire the type of self-reflective writing that could help students (it would be great to use as prewriting for college essays!). “Embarrassment” is another one of my favorites. We’ve all been embarrassed, and for students, their embarrassments tend to linger a little longer, sting a little harder. Snider’s “Embarrassment” could inspire students to think about those moments worth writing about. But beyond that, Snider’s playful use of color can also inspire further creativity. It would be great to grab some paint chips from the hardware store and ask students to think about how another abstract concept (like embarrassment) might be represented through color (I imagine shades of bright yellow for joy, or shades of blue for nostalgia). So there you have it… at least four different ways to use Snider’s The Shape of Ideas. And what I’ve shared here is only a tiny sample of the goodness that’s inside this text – there are so many more possibilities (just do a quick Google image search, and you’ll see what I mean!). It’ll be exciting to see how this works next year (that is, after a most welcome and needed summer)! 🙂 What do you think? Do you see other possibilities? Please share them below! amazing post!! thank you so much for the incredible reflections and teaching ideas!! I loved reading your post. Thank you for sharing your ideas! I hope to incorporate these concepts and more ideas from his book (which I bought!). I am getting excited for the coming school year!